Rescue Team 8 is rated 3.0 out of 5 by 20. Rated 5 out of 5 by GloomySunday from Excellent new addition to the series I wasn't in a hurry to try out this game as it is the eighth in a series and I didn't expect much new and interesting content. However, I was pleasantly surprised. Rescue Team 8 keeps its entertaining formula, so that the game is easily playable without an introduction and with the hints turned off (I'm always pleased when this option is available). It is still possible to click ahead - another impotant option for me. So, basically, not too much has changed, but they managed to bring in some nice new twists. As in earlier games, animals have to be rescued in some levels, but this time the requirements for this a bit different, which I liked. Also some levels take place in a cave where one has to power generators to show the next part of the cave system. Another nice new addition. The pace was good, the one-hour-demo flew by and I thought the challenge was enjoyable. First levels were a bit slower, naturally, but not too slow for first levels. The challenge picks up nicely, it's not too difficult, but there were moments when I had to think a bit about what to do next. I felt thoroughly entertained and will definitely purchase this game. Rated 5 out of 5 by creeo from My Favorite Game of the Series! I purchased this from a different site as I couldn't wait to play it. I love this game! Challenging without being impossible, the speed is good but my favorite part is not having to work out of two bases at once! 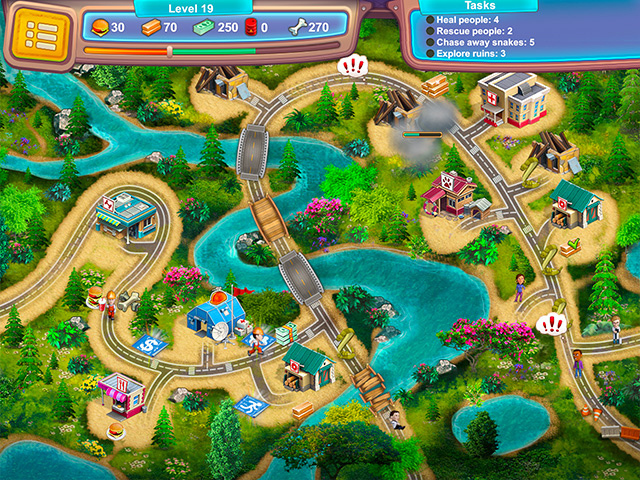 Rated 5 out of 5 by biscuitsmama from RESCUE TEAM 8 IS SO MUCH FUN! 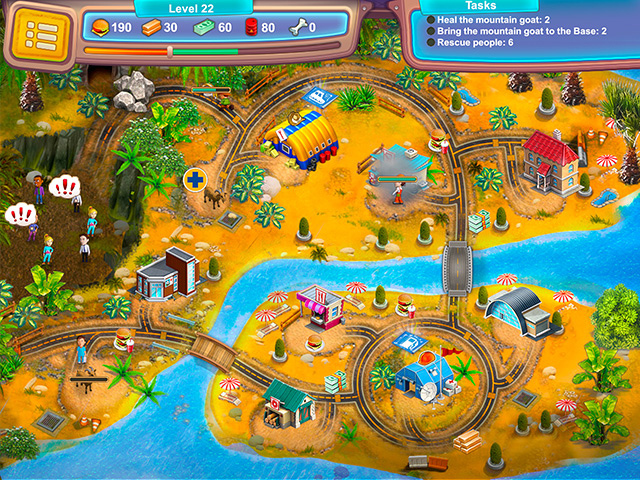 Rescue Team 8 is a game that I have had so much fun playing! I am by no means an expert with TM games but several of the games in the genre have become the ones I immediately grab up when they appear, and Rescue Team is at the top of my list. In Rescue Team 8 Pietro Mangula, a famous poacher, has stolen all of the animals and destroyed the reserve. 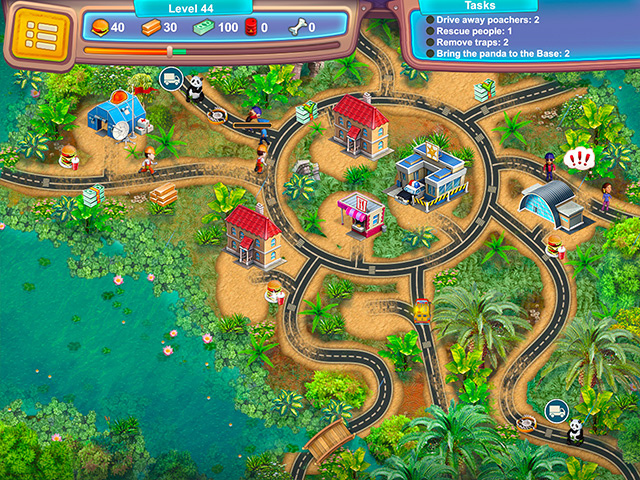 Now you and your Rescue Team friends must go to work to save the animals, rescue people, and rebuild the reserve. Wow, even I could play this game and have had so much fun this morning doing it that it will be hard to pull myself away for those real-life tasks that need to be done. If you are new to the TM genre and want a game that can be played in a relaxed mode as you learn how to play, then Rescue Team 8 is a game I think will fit the bill as you find out how much fun a TM game can be. Every time a new Rescue Team game is released I am right on it and know it is a game that will be a lot of fun. Not only will you need to rescue and restore as you play, you will also need to figure out the best strategy for accomplishing your goals. Although I play the game in the relaxed mode the first time through, the next time I am a bit braver and will select a different option for playing the game but no matter which option I select, I still have fun playing without the stress that I find in some TM games. Rescue Team 8 is an excellent game and one I love but, as always, please try the demo to see if you will enjoy. Happy gaming! Rated 4 out of 5 by Just_Joie from Not Everyday Is Perfect This is my favorite TM series, and I really love it. For once, I bought this without even playing the demo based on the strengths of past releases. I bought 4 thru 8. But, it very definitely feels like different developers behind the scenes, and it felt like a kid's game versus the previous which never had that cross my mind. The story line feels lame, the scenarios are just ok, and some of the wording tells me the writer did not have English as a first language. This is very similar but not really like the previous four. Try the demo, it still is fun and really good, just to me it is not the usual for this crew and I will not be auto-buying from them in future, though I do not regret the buy. Just let down a bit. Rated 3 out of 5 by shoelesshs from Disappointed :/ I have purchased all the previous Rescue Team games, so I was excited when this one came out. However, this one was disappointing. The game was not as challenging as previous games - pretty much the same thing every level and no real challenges. Although they did get rid of the super slow sky trolleys, I kinda miss the fireballs and earthquakes that made the previous games challenging. I agree with those who say the that the bonuses you purchase with don't really seem to make a difference. No one seems to really speed up unless you use the level bonus spaces, and those are few and far between. The most disappointing thing, however, was being unable to complete the Rescue Base. I completed the game with 3 stars for every level. but did not have enough coins to purchase all the properties. Going back and playing levels again made no difference. Even though purchasing those things don't really help you play the game, it's a fun little bonus. Why have it at all if you can't complete it? Sad! For that reason, i cannot recommend this game. Rated 3 out of 5 by LMachpherson from Not much of a challenge In fairness I only got to level 6 before my demo time ran out, but I agree with some of the others in saying it was not much of a challenge. There were a few times I got distracted and was still able to make the level in 3 star time. I really like the Rescue Team series, but this one is a "meh" for me.